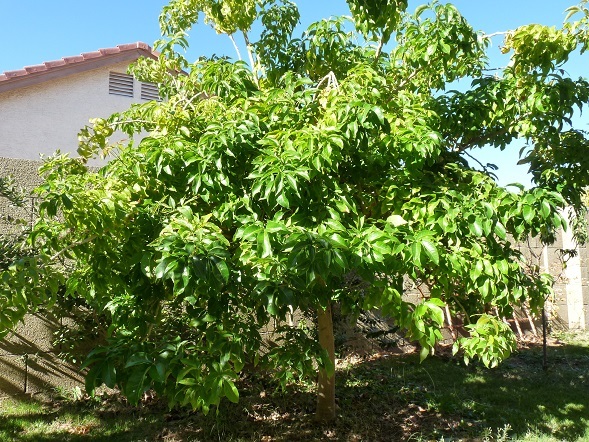 This 8 year old, 10 foot tall, grafted, Suebelle white sapote was photographed in November. This tree was planted in the fall. During its first two summers, it would start shedding its leaves in June, when the weather got hot, so it was protected from the sun underneath a shade cloth structure. From the third summer on it was not protected from the sun and suffered no ill affects. It is located on the west side of the house, in the lawn, on the east side of a cinder block wall. Being located a fair distance, 9 feet, from the western wall of the house helps the tree avoid the baking reflected heat it would be exposed to if it was located closer. A small basin around the white sapote is kept free of grass, and is lightly composted. This tree is not fertilized because it salt burns very easily. It is watered by the sprinklers but it is also occasionally deep soaked. From the time it was planted it flowered every year in early spring, in February, but did not set fruit until its 6th year. 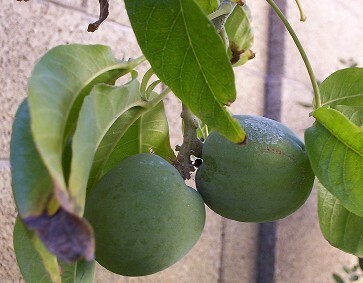 The fruit become ripe in October and November. Contrary to some sources of information, white sapotes have an excellent flavor when grown in the Arizona desert. Having attractive white bark, a dense canopy, and delicious fruit, makes white sapote a very desirable tree. They struggle a bit with the summer heat but become more resilient when they are established. Hard freezes will defoliate the tree but will not kill the larger branches. White sapotes are salt sensitive and therefore one must be very careful not to burn them with fertilizer. some sources recommend. Suebelle fruit turn from green to yellow to orange as they ripen, but they stay in this yellow to orange stage for a long time before they are actually ripe. In fact, a fully ripe fruit may even still have green patches on it. Since it is hard to tell if a fruit is ripe by its color, it is more effective to determine ripeness by how soft the fruit is. Give the fruit a firm squeeze with your finger tips. If one of your fingers sinks in, the fruit is ready to eat. Fully ripe fruit easily separate from the branch. White sapote fruit is somewhat unusual. It is generally the size, color, and shape of a large green apple. The flesh of white sapotes is custard like and the taste can be described as similar to vanilla pudding, or pumpkin pie. 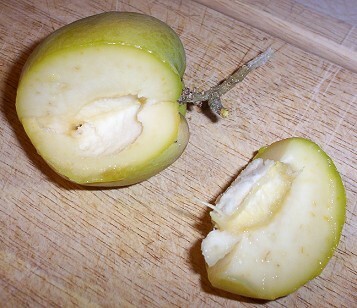 Overripe white sapote have a flavor similar to overripe bananas. The skin is bitter and should not be eaten. The seeds are reportedly toxic (as are peach seeds believe it or not) so take care not to eat them. Since the seeds are large and relatively firm it is fairly easy to eat around them and spit them out. Large trees can produce a lot of fruit, so white sapote trees can be somewhat messy, and should not overhang a driveway or walkway or pool. Buy a grafted white sapote tree to insure good quality fruit. One of the best varieties is Suebelle which is self fruitful and is available in select nurseries in the Phoenix area. White sapote trees should be protected with shade cloth for the first two summers after planting. Once established they tolerate the heat well as long as they are given sufficient water. Being hardy to 24 degrees F. white sapotes are as cold tolerant as citrus, so frost damage is not much of a concern in the Phoenix area. The tree pictured above survived 26 F. in January of 2007. It lost all of its leaves but quickly recovered. Dig a hole at least twice the size of the rootball. At a minimum, make the hole 2 feet in diameter and 2 feet deep. Back fill the whole with the same native soil that was removed. It also is a good idea to finish with the hole an inch or two recessed so that a watering basin is formed. After planting, spread a thin layer of compost on top of the soil to help conserve moisture and to supply some nutrients. White sapotes do well on a grass watering schedule. An occasional deep soaking will help the tree fend off salt burn and encourage the roots to grow more deeply. Basin and sprinkler irrigation are both suitable for white sapotes. White sapotes are sensitive to soil salinity. Since Phoenix area water is already high in salts, the safest thing to do is to not use any chemical fertilizers. Top dressing soil amendments such as compost are beneficial, but not necessary. I do not fertilize my white sapote at all with nitrogen fertilizers and it grows steadily. If a white sapote tree is grown in the grass, make sure to stay several feet away from the drip line of the tree when fertilizing the grass. My white sapote occasionally starts looking pale, which is a sypmptom of iron deficiency. This paleness is usually accompanied by slow growth. When this happens I use EDDHA, a chelated iron, in the soil. I have also found that an occasional feeding of manganese sulfate can help when the plant seems stubbornly chlorotic and chelated iron does not seem to work. White sapotes can be grown from seed, but good fruit will only be reliable on grafts. Some caterpillars like white sapote trees but usually do not cause any significant problems. If they do start to cause too much damage they are easily controlled by the "squish with pliers" technique.